I dry embossed the bottom portion of the card with the large polka dot EF, added a glimmer brad to the flower and called it done! I love the glossiness of the embossing....really makes things pop! And I am always needing thank you cards for my customers, so this will come in handy! 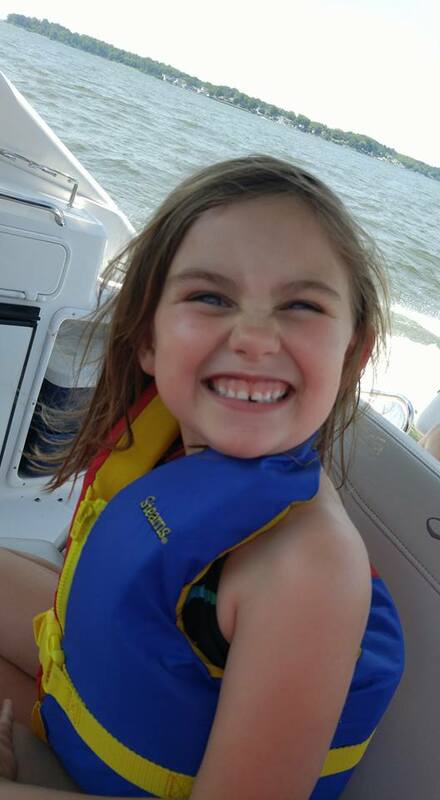 Cassidy took a little boat ride over the weekend...do you think she enjoyed it? Very pretty card, LeAnne! I love the bold black with the pink, and better yet, I haven't seen anything like it yet. Great card! Love the colors you chose and how you used the embossing! That bold sentiment is something else! I love that it is shiny and how it looks with the Flirty Flamingo! Love the glossy black die cut sentiment!! This is such a pretty card. You know you had me with those big embossed polka dots!! Yep, she looks like she was tickled pink to be on that boat!! Leanne you really chose some wonderful colours to work with this week for the challenge! Your card is awesome!